Kathryn Casey - We Ate Cake! 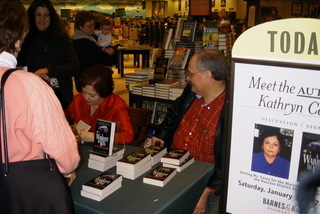 A great time was had at the July 8th booksigning at Houston's Murder by the Book. What a crowd. There were familiar faces, friends, family, and colleagues, along with the many first-timers I so enjoyed meeting. We had such an outstanding turnout that the store ran out of books! To my delight, store manager David Thompson ordered more and requested that I stop in and sign them for orders and the store's shelves. I did that last week. So if you're looking for an autographed copy of either SINGULARITY or A DESCENT INTO HELL, pop over to MURDER BY THE BOOK's website: www.murderbooks.com. Meanwhile, A DESCENT INTO HELL is selling well, and the response from has been amazing. So many are e-mailing to say they identify with Sharon Cave, both early on, when she struggled with Jennifer's drug problems, and later, after the tragic murder, as Sharon fought for justice. I can understand why they're impressed by Sharon. So am I. She's truly a remarkable woman, one of the most inspiring I've written about. Thank you also to those who knew Colton Pitonyak and Laura Hall, before and at UT, who have contacted me to say the depictions in the book are right on. I interviewed everyone I could who was willing to talk, and that turned out to be a lot of folks, thank goodness. I try hard to get the cases right, but it's always wonderful to hear that a book is fair and accurate. Okay, now to the headline and the photo of the cake above: The photo on the immediate left is from my booksigning, and it's of my fellow Women in Crime Ink bloggers. Left to right: investigative specialist Donna Weaver (who flew in all the way from Florida), cold case detective Connie Park, yours truly, crime writer Vanessa Leggett, TV news reporter Cynthia Hunt, and 48 Hours producer Jenna Jackson. 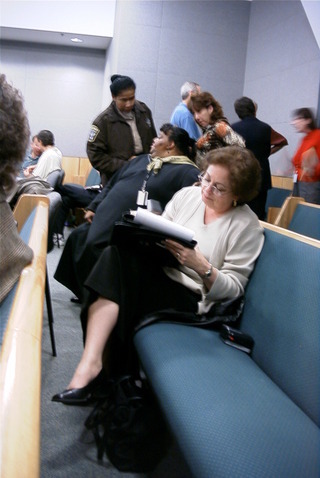 Also attending from WCI, although she had to leave before picture time, was well-known defense attorney Katherine Scardino. After the booksigning, the WCI gals and some of my closest friends journeyed across the street to Under the Volcano. Those of you who read DIE, MY LOVE may remember it as the bar where Piper Rountree tried to set up an alibi. Well, we noshed, drank, told stories, and yes, ate cake. It was a wonderful evening, one I'll never forget. Thank you to everyone who attended. I wish you all could have been there.